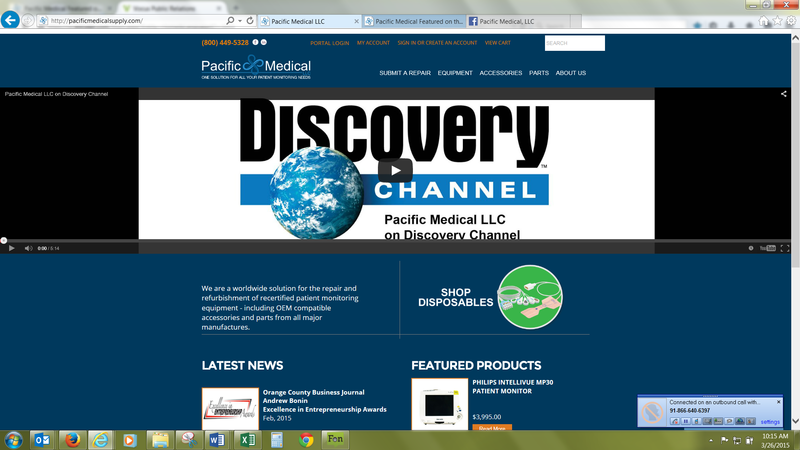 Pacific Medical LLC, the leader in patient monitoring equipment and repairs, is pleased to be featured on Innovations with Ed Begley Jr, which aired on the Discovery Channel on March 18, 2015. The episode will repeat on local cable channels by regional status, and it is live on the Pacific Medical home page at: http://www.pacificmedicalsupply.com. For families that face life threatening emergencies, it is reassuring to trust the integrity of the medical equipment that is serviced or repaired by Pacific Medical. Pacific Medical is featured in the Innovations segment as the number one source for quality equipment repairs and purchases while supporting one of the fastest growing segments in the health care industry: biomedical engineering. Biomed engineering merges medical technology and engineering within the healthcare environment. Clinical engineering is a specialty within biomed engineering—biomedical engineers are the “heart beat of the hopstial.” They are in charge of the safe installation and maintenance of all hospital medical equipment, and they work in the industry based around the servicing and replacement of medical devices. The biomed engineers look to Pacific Medical as a partner for repairing all the equipment they support for the entire hospital. “We are a quality-focused, customer-facing organization which understands and delivers innovative solutions for the greater good of our customers and biomeds. This approach, in-turn, ensures the safety of millions of patients worldwide,” said Andy Bonin, CEO and President of Pacific Medical. Pacific Medical is a leading medical-device service depot focusing on quality and cost effective solutions for hospitals that purchase and service their medical equipment. The company is also dedicated to customer service as the corner stone of the organization. The company believes in the quality of work before the order is shipped and also provides after service-support for the biomedical engineering community. “Pacific Medical focuses on cost saving solutions without sacrificing quality by continually investing in the education of our technicians and engineers; this allows us to repair specifically to manufacturing specifications while being proficient down to the component level. Replacing components can save our customers hundreds or thousands of dollars on each piece of equipment,” said Eric Hatteberg, Director of Sales of Pacific Medical. The Innovations segment provides an excellent overview of Pacific Medical’s commitment to the industry while supporting the biomedical community. Pacific Medical LLC is the trusted and established leader for purchases and repairs of patient monitoring equipment. The company provides hospitals and surgery centers worldwide with the security that millions of patients’ lives are safe in the hands of Pacific Medical. Celebrating its 10 year anniversary this year, and with dual ISO certifications, the company continues to meet emerging industry demands in patient safety and quality. Pacific Medical specializes in Monitors, Modules, Telemetry, Infusion Pumps, Suction Regulators, Fetal Transducers, SpO2/ECG/TEMP/NIBP Cables, O2 Blenders, Endoscopes and Gas Analyzers. Pacific Medical carries the largest patient monitoring inventory in the industry and is recognized for its cutting-edge customer service response team. For more information visit: http://www.pacificmedicalsupply.com.